In case you missed any of our Celiac Awareness Month weekly recipe round-ups, we’ve collected all of our Gluten Free, NOT Flavor Free recipes in one place! From appetizers to desserts, here are all of the recipes our food bloggers contributed to our monthlong celebration. 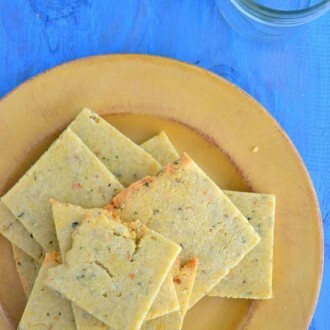 Amie says: I’ve been making almond flour crackers for myself and my dad (who loves them)—I got him off of eating Ritz Crackers and Cheez-It’s for the past 15 years and now I have him hooked on almond flour crackers. 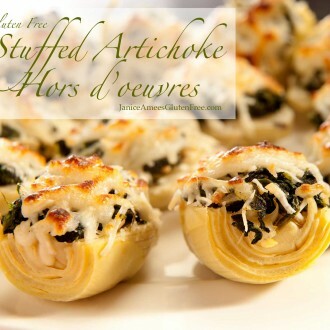 Janice says: I thought I’d try to make a lighter, gluten free, low-carb (since it doesn’t require chips or crackers) take on that warm, creamy artichoke dip we all enjoy by making an hors d’oeuvre version. 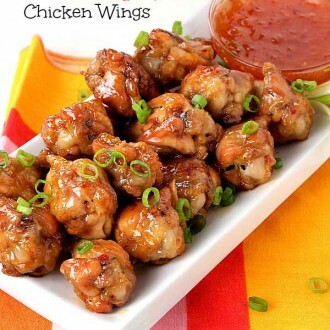 Jeanine says: You won’t believe how easy it is to make amazing wings at home. These Crispy, Sweet and Spicy Chicken Wings are baked instead of fried so you still enjoy them while watching your calorie intake. 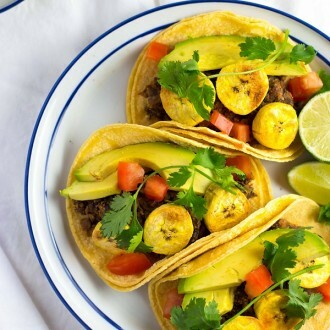 Isadora says: Mexican food has always been my favorite type of food so when I went gluten free I was so happy to find that most of my favorite Mexican foods were naturally gluten free! 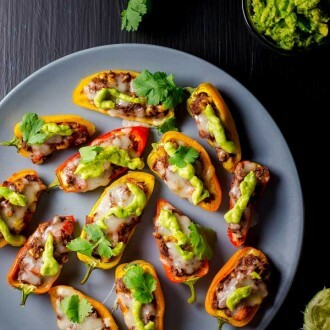 These Tex Mex Sweet Pepper Poppers are full of flavor and perfect for your summer get-together! 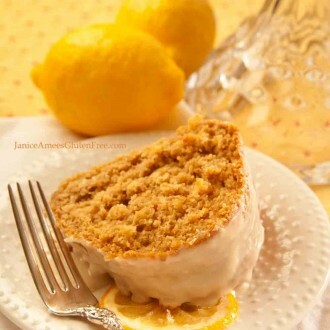 Jamie says: This recipe is a family favorite! We especially enjoy it during football season. 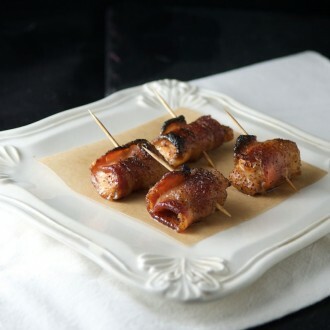 This appetizer is easy to make, naturally gluten free and everyone loves it. Johnna says: We will soon have a proliferation of fresh basil from the garden, perfect for making pesto. 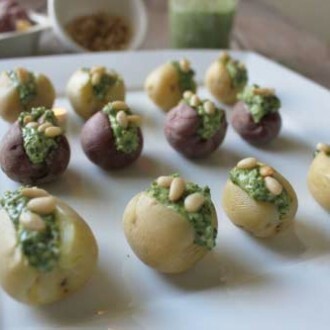 These tasty little bites are wonderful warm OR perfect for a picnic chilled. 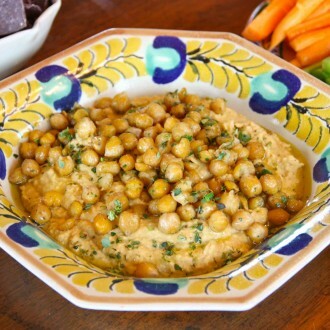 Kristine says: Whenever my friends taste this scrumptious dip, they request the recipe. It is inspired by a dish I ate at one of my favorite Los Angeles restaurants. 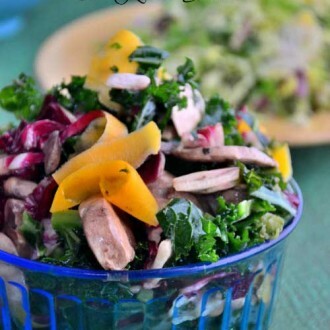 Johnna says: Inspired by a dish at my favorite tapas restaurant, this salad is hearty enough to be a meal. The addition of avocado to the dressing adds creaminess to the salad, which has just a hint of sweet thanks for fresh figs. 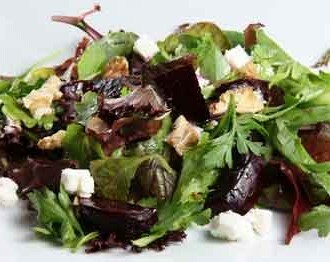 Kristine says: For a memorable spring salad, I like to toss bite-sized pieces of beets with lettuce and a mustardy vinaigrette, and then sprinkle with feta cheese and walnuts. Roasting the beets intensifies their wonderfully earthy flavors. 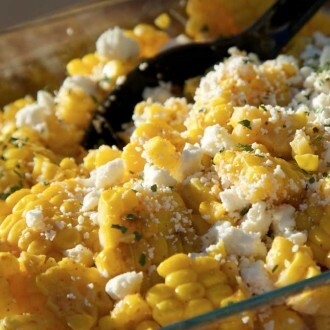 Jamie says: Perfect side dish for a summer barbeque. A splash of lime and cilantro make this corn dish anything but boring. 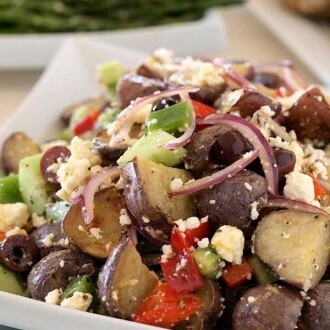 Jeanine says: Loaded with red and green peppers, cucumber, Kalamata olives, red onion, and Feta cheese, this Mediterranean Potato Salad isn’t your Momma’s potato salad. This mayo-free salad is perfect for picnics and gatherings. 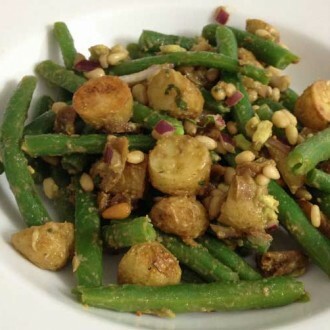 Janice says: This flavorful dish is full of fiber and can be served as a main dish or on the side. It’s perfect for vegetarians or vegans, but meat eaters are sure to love it too! 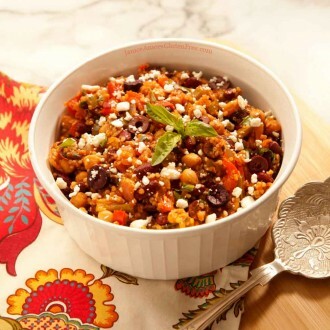 Each serving contains almost 9 grams of protein, which comes from both the beans and the quinoa. 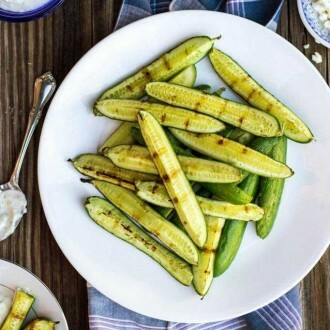 Isadora says: The grilled cucumbers marinated in vinegar go so well with the pickled feta dip, it is kinda like pickles on pickles and who doesn’t like that? Amie says: Lately….I’m obsessed with butternut squash recipes. You’ll see why when you dig into this fabulous salad. 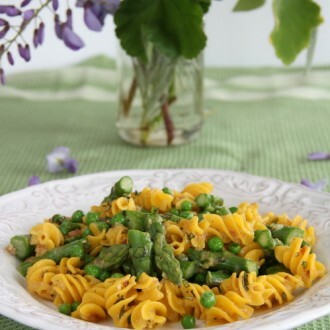 Kristine says: This beautiful and satisfying pasta dish features asparagus and peas which are now in season. I make pasta frequently for a quick dinner. Isadora says: Tacos are one of my favorite go-to meals to cook when I’m tired or don’t have much time. I’ve jazzed these ones up by making my own re-fried beans and adding some delicious roasted plantains! Johnna says: Traditional Korean Japchae is served over noodles made from sweet potato starch. 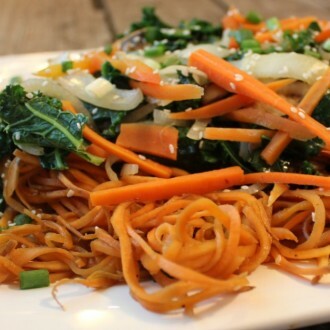 I enjoy spiralizing vegetables and used spiralized sweet potatoes in place of the traditional noodle in this dish. 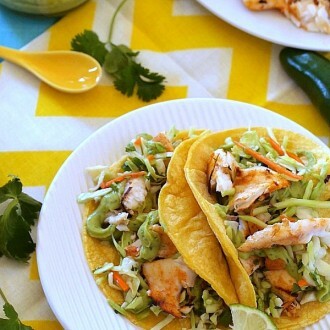 It’s a crowd favorite, my most requested dish! Jamie says: Family night is pizza night! 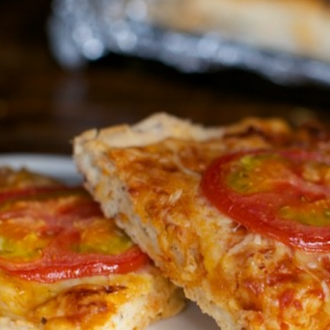 This pizza is large enough to feed a whole family and easy to customize for picky eaters. 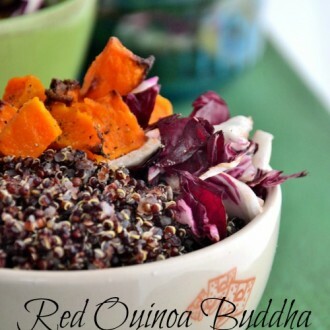 Amie says: I’ve got one of my favorite quinoa recipes for you today…because cooking quinoa is super simple and fabulous! Janice says: Light, fresh, easy to prepare, and perfect for those warm summer evenings – whether dining Al fresco or inside — with family or friends, it makes for a pretty main course or a side dish. 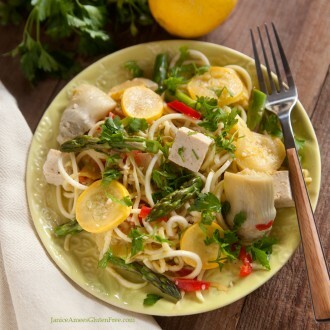 You can make it with your favorite gluten free pasta OR go low-carb with zucchini noodles as I have done here. Jamie says: Gluten free baking can be tricky. This recipe is a no-fail dessert that everyone loves. Serve with some fresh fruit and whipped cream for a great summer dessert. 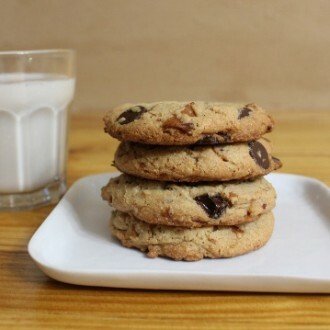 Johnna says: These are my favorite cookies to share at a gathering, since they work for so many of my friends. 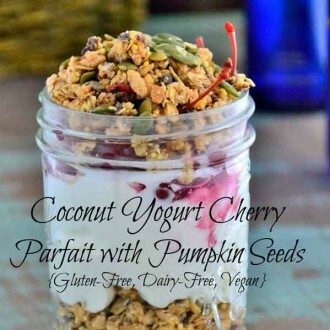 They are vegan, vegetarian, dairy-free, egg-free, gluten-free, grain-free and Paleo. I love a recipe that works for almost everyone! Janice says: It’s tangy and sweet, and moist and light, and crumbly (like a cake should be), and you would never know it’s not full of gluten. 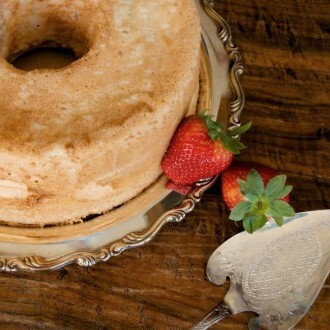 It can also be made dairy free and into smaller bundt size cakes, if you like. 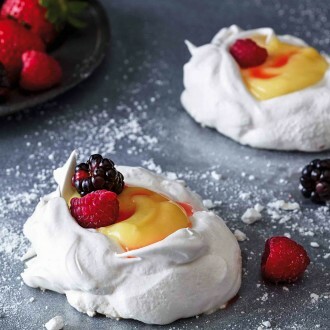 Kristine says: Cardamom-scented meringue nests are ethereal and crunchy with a not-too-sweet, not-too-rich yogurt and lemon curd filling—a perfect, naturally gluten-free finale for a festive meal. 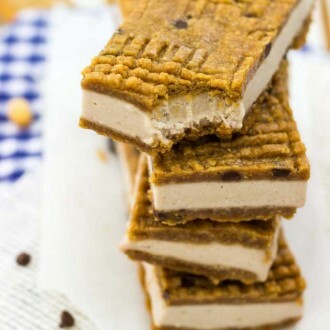 Isadora says: Not only are these delicious ice cream sandwiches both gluten free and vegan, but you don’t even need an ice cream maker to make them! They are the perfect dessert for the summer heat! 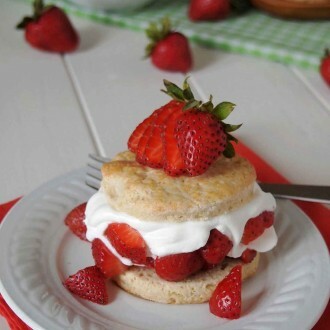 Jeanine says: With berry season being in full swing, these easy gluten-free Strawberry Shortcakes are the answer to “What’s for dessert?” Short on strawberries? They are also great with blueberries or peaches.